I finally saw a ‘new’ bird for January; a White-throated Sparrow, the tan variety. I believe I saw this bird some weeks ago. I’ve had White-crowned Sparrows here before…which look somewhat similar, but they lack the beautiful white throat and yellow lore. However, because of the over-all buffer color and stripper breast of this color variation of White-throated Sparrow, the white throat is not as conspicuous, nor is the yellow lore. I’d say, overall, this color-variation has less contrast. Last year, I managed to get pictures (myself!) of a young White-crowned Sparrow still molting into that beautiful black and white, stripped crown. At that stage they look a bit checker-boarded in tan, leading to confusing them with this tan variety of White-throated Sparrow. You can see my post and pictures here. The bird I saw today had a definite light throat…though not as white as the ‘normal’ version and it had the stripped head…though the contrast was not nearly that of the more common version, either. It had a clear, dark line through the eye and a long tail that it kept somewhat ‘cocked’ as it scratched about beneath my kitchen window where a thistle-feeder hangs; not like a wren, but more so than say a Junco. The bird above looks much like the bird I saw: brown stripes with tan, rather than white, alternate stripes. You can read about this bird, in all its versions here; they also have a recording of its call and a video of its behavior on the ground. The report there, discusses the difference in the two color forms, as well as mentions individuals almost always mate with a bird of the opposite morph and that the white-stripped birds are more aggressive than the tan-stripped ones. Oddly, both color types prefer females with white stripes, but both kinds of females prefer tan-stripped males. These genetic differences are unique among birds. The bird to the right is the white-stripped version. Po-lo" call that kids call back and forth when playing the hide-and-seek game. I never could see the bird (believing it was something new), but regularly have heard the call. I often answered it with a whistle, but suspect the ‘answer’ was more likely to another I’d hear a couple yards over. A birding pal, Dave Moore, suggested it might be a Black-capped Chickadee; but this sounded nothing like the "chick-a-dee-dee-dees" or the 'seets', and chatter that I’m used to hearing from the little black and white birds. However, I happen to have a copy of Ted Floyd’s Smithsonian Field Guide to the Birds of North America, a rather large ‘field guide’, but certainly worth having for the several beautiful photographs of each bird; great for research. Probably even better, if that’s possible, is the accompanying CD which holds 587 down loadable bird songs…again, several songs for each bird covered. Because of Dave’s suggestion, I popped in the CD and headed right for the BLCACH foulder (is that the abbreviation for this bird?) The first recording I clicked on was the exact call I’ve been hearing! Who knew? Wow! Seems most birds have several calls…kind of like discovering (on my own) that crows also make a weird rattling sound I heard when they were mobbing an owl, in addition to their caw-caw we most often hear. That was easy to confirm though, because I was watching the birds. I just love learning this stuff. One of the things I learned from another lovely little book; "Finding Your Wings: A Workbook for Beginning Bird Watchers, by Burton Guttman, is to be ready to identify birds. 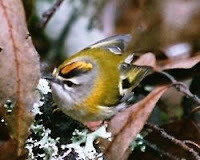 The author suggests reading about and knowing which birds to expect. I plan to spend more time listening to bird calls while I'm reading about the birds. I'm quite sure this will further help me learn to identify what I hear and see while out bird watching. Whoo hoo! And thanks to Ted Floyd who gave me the permission to post the call here...but then I couldn't figure out how to upload the file. Grrrrrrr; pictures yes, sound files no. You can hear the call on Cornell's site, here. 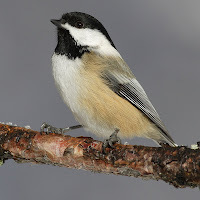 Addendum; Because of Bosque Bill's comments, I've added a link to a page with a whole bunch of different Chickadee calls. It's a wonderful page; check it out! Working with colleagues in Venezuela, Hawk Mountain Sanctuary color-marked more than 350 Turkey Vultures over-wintering in northwestern Venezuela in 2006-2007 and 2008-2009. The tagged birds are members of the meridionalis, or western North American, subspecies and were tagged to study long-distance migration in the species. The birds are expected to begin migrating back toward their breeding areas in February. Their movements should take them through Central America and Mexico and into the western United States and Canada. Reports of birds will help Hawk Mountain determine the timing and geography of migration in Turkey Vultures, as well as the breeding areas of the tagged birds. 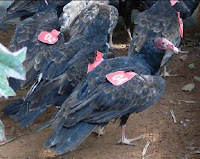 Some of the birds have red tags with white numbers, others have light-blue tags with black numbers. 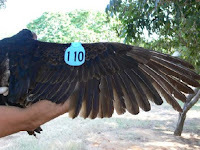 Please report the date and specific location of your sighting, color and number of the tag, the wing (right or left) to which the tag is attached, and the circumstances of the sighting, including whether or not the bird was alone or in a group of vultures, flying or perched, feeding or roosting, etc. Dead birds also should be reported. 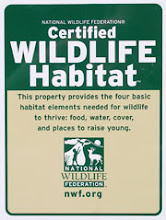 All reports will be recognized, and individuals reporting tagged birds will receive summary information about the study. Thank you. I spoke last time, about making gardening easier, using less water; having more time to enjoy the wildlife a native-planted garden will bring. 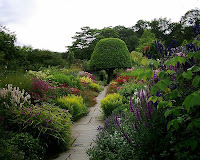 Do remember the bit about layering; planting tall in back and pulling edges toward the yard with progressively shorter plantings. Try planting in 3's and 5's for a more natural effect. In the fall, leave the leaf-litter, even rake leaves from the lawn up under the shrubs and trees; the birds will love that and the plants will thrive under protection from the elements. I call all this "Shabby-chic" gardening, but its million-dollar to the environment. Well...and your back! Please remember not to use insecticides and herbacides in your garden, either. These poison both good and bad bugs which are eaten by larger bugs, which are eaten by birds. And they kill our native bees, too. A diverse garden is a healthy garden. A few bad bugs cannot munch their way through an entire garden, unless that garden is already lacking diversity, numbers and health. Keep your garden healthy by planting in both numbers and diversity...and not using poisions; the whole world will thank you for it! That's a Blue Orchard Bee to the right; these highly valuable bees are quite friendly and seldom do they sting! catbirds, cedar waxwings, common flickers, downy woodpeckers, grackles, hairy woodpeckers, hermit thrushes, house finches, house sparrows, Lewis' woodpeckers, northern cardinals, northern mockingbirds, northern orioles, pine grosbeaks, red- headed woodpeckers, rose-breasted grosbeaks, ruffed grouse, song sparrows, stellar jays, Townsend's solitares, western tanagers, white-crowned sparrows, white-throated sparrows, wood thrushes. From 7’ – 30’. Some hardy to Zone 2. Native Maples, Evergreens, Aspen, Ash and Oak - Hugely important food sources to many, many birds and other wildlife. 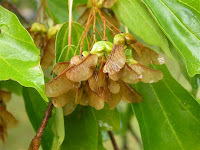 Maple flowers and seeds, Evergreen berries like the Juniper berry and of course pine cones and their seeds, Aspen flowers and o bviously acorns. Colorado's River Maple stays a fairly small tree, several evergreens are small and shrubby. 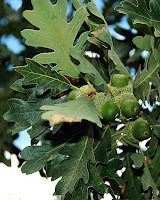 While Aspen can get quite big, Gambel and Live Oak are manageable and their acorns necessary to a great variety of wildlife. 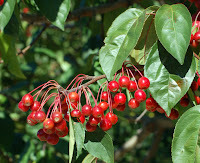 Viburnum – a shrub or small tree (150 species) that offers sizes from 2 to 30’ and which fruit, depending on variety, from summer through fall and winter. Most birds feed at this versatile plant. 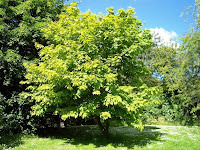 I look for several species for my yard; small trees with horzontal branching make them spectacular to look at. Smaller bushes provide the stepped-down look I want and more fruit and cover for the birds; all in a very natural, easy care yard. Many hardy to Zone 3. 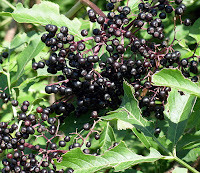 Elderberries – Over 100 species of birds eat them including American robins, black-headed grosbeaks, bluebirds, blue jays, brown thrashers, catbirds, cedar waxwings, common flickers, finches, grackles, house sparrows, northern mockingbirds, red-eyed vireos, red-headed woodpeckers, rose-breasted grosbeaks, titmice, towhees, white-breasted nuthatches, and white-crowned sparrows. Deer also enjoy this plant shrub or small, bushy tree. Hardy to Zone 3-4. Serviceberries and Chokecherries - Eaten by over 42 species of birds including American robins, brown thrashers, catbirds, cedar waxwings, chickadees, common flickers, downy woodpeckers, hairy woodpeckers, hermit thrush, house finches, juncos, kingbirds, mourning doves, northern orioles, phoebes, red-eyed vireos, red-headed woodpeckers, and scarlet tanagers. 10-25’ Hardy to Zone 4. Grapes - Over 90 species of birds eat them including American robins, blue jays, brown thrashers, cedar waxwings, evening grosbeaks, grackles, house finches, house sparrows, magpies, northern cardinals, northern mockingbirds, orioles, Stellar jays, towhees, and yellow-billed cuckoos. Hardy to Zone 4. Virginia Creeper, Honeysuckle, Silver Lace and other vines - Not only are these colorful plants useful in garden design for their beauty alone, and while it's true berries and flowers are enjoyed by birds and bugs alike...but who knew the Silver Lace Vine was so important to bees and other pollinating insects? Hardy to Zone 4. Hackberries - Eaten by over 45 species of birds including bobwhite, brown thrashers, cedar waxwings, common flickers, curved bill thrashers, eastern bluebirds, evening grosbeaks, hermit thrush, northern cardinals, northern mockingbirds, northern orioles, phoebes, pileated woodpeckers, some quail, roadrunners, red-bellied woodpeckers, titmice, and towhees. 25-75’ Hardy to Zone 2. 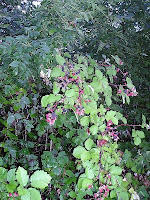 Mulberries - Eaten by over 55 species of birds including American robins, bluebirds, blue jays, brown thrashers, catbirds, cedar waxwings, downy woodpeckers, grackles, house sparrows, kingbirds, northern cardinals, northern mockingbirds, northern orioles, orchard orioles, red-bellied woodpeckers, red-eyed vireos, red-headed woodpeckers, rose-breasted grosbeaks, scarlet tanagers, titmice, wood thrush, yellow-billed cuckoos, and yellow warblers. Varieties from bush to large tree. Some hardy to Zone 5. 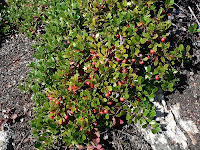 Winterberry or Holly and Blueberries – Over 80 species of birds eat them including American robins, black-capped chickadees, common flickers, grackles, house sparrows, kingbirds, many species of orioles, towhees, and tufted titmice. However, male and female flowers are produced on separate plants, so at least one male variety is needed for pollination and fruit set…which occurs on the female plants, and the plant prefers acidic soil; not generally found in CO and difficult to maintain. 4-6’ Hardy to Zone 4. 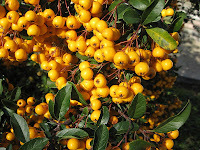 Pyracantha and Cotoneaster – Cedar Waxwings will eat Pyracantha berries till they’re drunk! 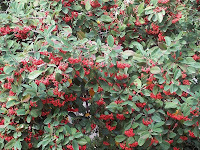 Most birds enjoy the berries produced by this spiny plant (also called Firethorn) With Cotoneaster (pronounced ka-tō'-nē-as-ter), you get a similar plant but without the often painful thorns! 4-6’ Hardy to Zone 5. 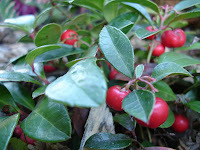 Ground Covers – such as Kinnickinnick, Wintergreen, Bearberry, Lingonberry and Low-growning Sumac (which is also not ‘itchy’) and several junipers are lovely and mostly evergreen plants that birds surely enjoy. Most hardy to Zone 2-3. Strawberries - Eaten by over 50 species of birds including American robins, blue jays, catbirds, cedar waxwings, common flickers, crows, evening grosbeaks, grackles, house sparrows, magpies, northern mockingbirds, some quail, rose-breasted grosbeaks, towhees, and wood thrush. Hardy to Zone 4. 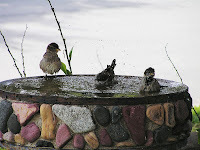 Create a Bird Garden: Plant Native! 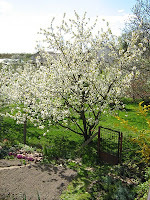 Trees and shrubs: Crabapple, Dogwood, and Viburnum provide fruit, but don’t forget Conifers (evergreen plants including pines, spruces, firs, arborvitae, junipers, cedars, and yews.) that offer escape cover, nesting sites and winter shelter, but also sap, buds and seeds. 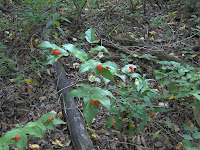 Fall-fruiting plants include Mountain Ash, Cotoneasters and Buffalo Berries. Birds also enjoy Aspen, Willow and Maple buds and seeds, and Sumac (the low-growing kind doesn't cause a skin reaction!) Hardy to Zone 3-4. 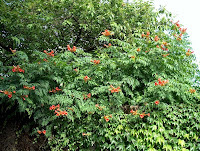 Vines and flowers: Native honeysuckle and Trumpet vines call hummingbirds like nothing else, but so do the flowers of Bee Balm, Butterfly bush, Columbine, Daylily, Foxglove, Hollyhock, Lupine, Verbena and Yucca…as well as Coral bells, Geranium, Impatiens, and Petunias. Red flowers are especially powerful in this regard. Virginia creeper is as hardy as the dickens and attracts woodpeckers and flickers, grosbeaks and bluebirds, among others. Hardy to Zone 3 or 4. Ornamental Grass: Many, many varieties of beautiful grasses left to go to seed on the edges of a garden not only look lovely, but provide both food and shelter to many varieties of bird; Juncos and Finches especially love grasses. Many colors and sizes from 10” to 15’ Hardy to Zone 3. 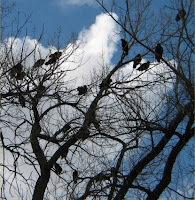 Dead Limbs or trees: As long as they are not a physical hazard in your garden, it is always a boon to birds to leave a dead tree where it stands. These ‘snags’ as they are called, offer homes to a variety of cavity-nesting birds. Leaf litter: Surely you’ve seen sparrows, juncos and titmice hopping through and flipping leaves in search of worms and bugs. Why not leave at least a portion of your yard un-raked…for your feathered friends. 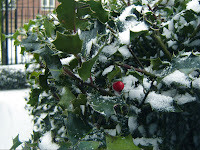 Or rake the lawn, but use the leaves as a winter dressing and protection for the garden. Water: Keep in mind how much energy a bird looses when it eats snow. Providing clean drinking water and a bath is perhaps most important in the winter time! Yes, birds must bath, even during winter. 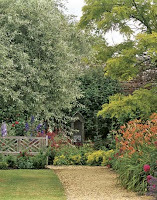 Landscape Layering: Step-down larger trees and shrubs by facing them with smaller trees or shrubs, then smaller shrubs still and then by adding native perennials and flowers at the front edges. 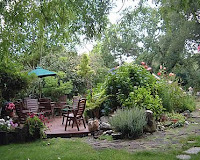 This stepped or layered affect (taller in back, smaller and lower in front: ‘stepping down’ from the edges of the yard into the interior), looks more natural, protects both plants and birds and makes for a more inviting yard and one that is easier to care for. Reduce turf; it saves water! 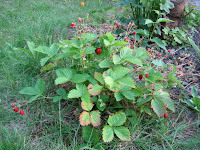 Summer Food: the first bruits that ripen include cherry, chokecherry, native honeysuckle, raspberry, serviceberry, blackberry, blueberry, mulberry, and elderberry. 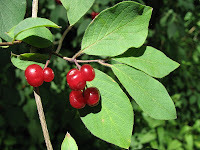 Fall Food: include dogwoods, mountain ash, cotoneaster, and buffaloberry, all of which are an important source of fat-building food for migration or just getting ready for winter. 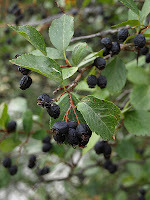 Winter food: or food that remains on the plant after it ripens (or perhaps must freeze and thaw several times before it is edible) include Chokecherry, Snowberry, Bittersweet, Sumac, High-bush Cranberry, Wahoo, Virginia creeper and Chinaberry. 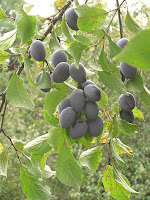 In most cases, it is possible to purchase several varieties of a favorite tree or shrub which fruit at different times of the year, thereby providing a year-round natural food supply. I've been somewhat remiss lately, as I've gotten involved with a wonderful group of folks who put on our Community Theater. Awesome people who work very hard to keep the arts alive in La Veta. I've volunteered to create their newsletter and update a three-year old website. I'm having fun, too! As for birds, I've listed the ones, below, that I noticed during the first month of this year. Yesterday I saw the first Red-winged Blackbird of the year, too. Not sure yet, what I think of that...last year I had hundreds of them, along with Yellow-headed cousins, Grackles, Brown-headed Cowbirds, and Starlings...and just discovered the blasted Starlings are not only here, but are already nesting inside my attic; I've heard chicks! Bah. As an aside, the White-winged Dove that had been hanging around for the last several months turned up with something on it's feet. It looked like a fuzzy fungus of some sort. Or...feathered feet, which I doubt suddenly occurred! I'm guessing the thing walked through something sticky and while sitting on the power-lines got some breast-feathers stuck onto it's feet. The sad thing is, the bird has not been around for a couple days; this after seeing it daily. I really don't know what to make of it. Perhaps it walked through a puddle of anti-freeze? I know if it drank some it'd be dead pretty quickly...I wonder if the stuff would make it's feet sticky, too? I'm pretty sure WHWDs don't have feathered feet, usually. The only other thing I have to report is the single House Finch I've seen this year with bad eyes. Lets hope we don't have as many sick finches this year as last. Please, keep those feeders clean!